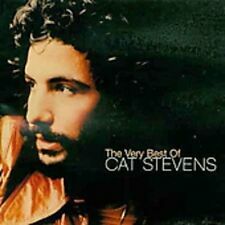 Cat Stevens - The Very Best Of Cat Stevens. Title:Cat Stevens - The Very Best Of Cat Stevens. Artist:Cat Stevens. Your item will be previously owned but still in great condition. The disc will play perfectly without interruption and the case, inlay notes and sleeve may show limited signs of wear. Lulu : Greatest Hits CD (2003)Title: Greatest Hits Artist: Lulu Genre: Rock/Pop|Pop Duration: 63.10 mins Format: CD / Album Type: CD No. of Discs: 1 disc(s) Studio / Label: Virgin EMI Records UK Release Date: 10 Nov 2003. Rush : Spirit of Radio: The Greatest Hits CD (2003)Title: Spirit of Radio: The Greatest Hits Artist: Rush Genre: Rock/Pop|Progressive Duration: 79.40 mins Format: CD / Album Type: CD No. of Discs: 1 disc(s) Studio / Label: Virgin EMI Records UK Release Date: 10 Mar 2003. Amy Winehouse - Frank. Title:Amy Winehouse - Frank. Artist:Amy Winehouse. Your item will be previously owned but still in great condition. The disc will play perfectly without interruption and the case, inlay notes and sleeve may show limited signs of wear. Of Discs: 1 disc(s) Studio / Label: Island Records UK Release Date: 07 Apr 2003. Disc 1 2 Faceless 3.35 mins. Disc 1 14 Awake 5.45 mins. Disc 1 13 Keep Away 7.42 mins. Disc 1 12 Serenity 4.36 mins. Disc 1 11 The Awakening 1.29 mins. Trouble [explicit] [us Import] CD (2003)Title: Trouble [explicit] [us Import] Genre: Import|Import Format: CD / Album Type: CD No. of Discs: 1 disc(s) Studio / Label: Universal Music UK Release Date: 17 Nov 2003. Format: CD. End Of The Sky. I Could Have Loved You. Classic Artists. (I Wish I Knew How It Would Feel To Be) Free/One. Rare Collectables. Loving Every Minute. Catalogue Number: 761662. 1 14 Next Year, Baby. 1 11 Wind Cries Mary. 1 10 All At Sea. 1 9 I Get A Kick Out Of You. 1 7 I Could Have Danced All Night. 1 6 Old Devil Moon. Format: CD. I Could Never Miss You (More Than I Do). Sale Corner. Classic Artists. I Don't Wanna Fight. First Of May. Boom Bang-A-Bang. What's New Pussycat. Tom Jones – Greatest Hits. She's A Lady. New CD (sealed). Baby It's Cold Outside (feat Cerrys from Catatonia). 100% Original Product. Daughter Of Darkness. If I only Knew. Tom Jones - Greatest Hits 2003 (2003). Condition is New. Dispatched with Royal Mail 1st Class Large Letter. Counting Crows : New Amsterdam - Live at Heineken Music Hall Feb 4 - 6 2003 CDTitle: New Amsterdam - Live at Heineken Music Hall Feb 4 - 6 2003 Artist: Counting Crows Genre: Rock/Pop|Rock Duration: 79.60 mins Format: CD / Album Type: CD No. Nina Simone : Gold CD (2003)Title: Gold Artist: Nina Simone Genre: Jazz|Vocal Duration: 136 mins Format: CD / Album Type: CD No. of Discs: 2 disc(s) Studio / Label: Universal Jazz UK Release Date: 09 Jun 2003. Bon Jovi : This Left Feels Right CD (2003)Title: This Left Feels Right Artist: Bon Jovi Genre: Rock/Pop|Rock Duration: 62.20 mins Format: CD / Album Type: CD No. of Discs: 1 disc(s) Studio / Label: Virgin EMI Records UK Release Date: 03 Nov 2003. The Best Of Musical Youth CD (2003) NEW Title: The Best Of Musical Youth Genre: Reggae|Ska Duration: 46.50 mins Format: CD / Album Type: CD No. of Discs: 1 disc(s) Studio / Label: Island Records UK Release Date: 14 Apr 2003. ORIGINAL CD IN EXCELLENT CONDITION. 1708K / 877GB. Various Artists - Indecent Proposal. Title:Various Artists - Indecent Proposal. Artist:Various Artists. Your item will be previously owned but still in great condition. The disc will play perfectly without interruption and the case, inlay notes and sleeve may show limited signs of wear. Light surface scratches on disc. Echoes CD (2003)Title: Echoes Genre: Rock/Pop|Indie/Alternative Duration: 46.50 mins Format: CD / Album Type: CD No. of Discs: 1 disc(s) Studio / Label: Virgin EMI Records UK Release Date: 08 Sep 2003. Jimi Hendrix : Voodoo Child: THE JIMI HENDRIX COLLECTION;SPECIAL EDITION CDTitle: Voodoo Child: THE JIMI HENDRIX COLLECTION;SPECIAL EDITION Artist: Jimi Hendrix Genre: Rock/Pop|Rock Duration: 153 mins Format: CD / Album Type: CD No. The Albinoni Collection CD (2003)Title: The Albinoni Collection Genre: General|tbc Duration: 137 mins Format: CD / Album Type: CD No. of Discs: 2 disc(s) Studio / Label: Universal Classics UK Release Date: 08 Sep 2003. What's New Pussycat. Baby, It's Cold Outside (With Cerys Matthews). Kiss (The Art Of Noise). Burning Down the House (With The Cardigans). Daughter of Darkness. Boy From Nowhere. Funny Familiar Forgotten Feelings. Artist Various Artists Title Verve Unmixed 2 Release Date 2008-06-18 Label: EMI Records Number of Discs 1. 1 12 Mama - Hugh Masekela. 1 9 Soul Sauce (Guachi Guard) - Cal Tjader. 1 8 Do What You Wanna - Ramsey Lewis. Whatcha Talking 'Bout. Young Generation. Pass The Dutchie. Format: CD. Let's Go To The Moon. Classic Artists. Catalogue Number: 1316912. Sale Corner. Ghost in the Machine CD (2003) NEW Title: Ghost in the Machine Genre: Rock/Pop|Rock Duration: 41 mins Format: CD / Album Type: CD No. of Discs: 1 disc(s) Studio / Label: Polydor UK Release Date: 16 Jun 2003. The Music of Bollywood CD (2003)Title: The Music of Bollywood Genre: General|tbc Duration: 216 mins Format: CD / Album Type: CD No. of Discs: 3 disc(s) Studio / Label: UM3 UK Release Date: 17 Feb 2003. Timing Is Everything CD (2002)Title: Timing Is Everything Genre: General|tbc Duration: 41.20 mins Format: CD / Album Type: CD No. of Discs: 1 disc(s) Studio / Label: Virgin EMI Records UK Release Date: 16 Sep 2002. Yello : The Eye CD (2003)Title: The Eye Artist: Yello Genre: Rock/Pop|Electronic Duration: 60.30 mins Format: CD / Album Type: CD No. of Discs: 1 disc(s) Studio / Label: Virgin EMI Records UK Release Date: 03 Nov 2003.